Schools play an important role in supporting the health and wellbeing of children and young people. Research demonstrates that pupils flourish in a positive environment where they are given a voice to influence whole school decisions. This is endorsed by recent education and health white papers which highlight how schools can help children and young people to become happier, healthier and more ready to learn and achieve their full potential.At our school we have developed policies and best practices that promote improvement in children and young people’s health which in turn helps pupils achieve their potential, raising levels of achievement, improving standards and life chances. 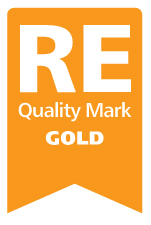 The REQM recognises high quality RE, particularly those schools which are providing their learners with authentic experiences and contributing to whole school outcomes.RE makes a powerful contribution to young people’s learning. It provides them with the chance to explore the big ideas of religion and belief and to think about what matters in their own lives. Investors in Families aims to help schools or any setting where young people learn to become family friendly.The evidence that children’s attainment will rise more dramatically when their learning at school is reinforced at home through informal activities. The desire for families to become partners with schools, in their children’s learning and closing the gap between social disadvantage and achievement. Investors in Families is an award that we have gained from submission of a portfolio of evidence and a visit from an assessor meeting national standards that are locally accredited but quality assured centrally. Artsmark is Arts Council England’s flagship programme to enable schools and other organisations to evaluate, strengthen and celebrate their arts and culture provision. It is delivered by Trinity College London and 10 regional Bridge organisations drive participation.Artsmark is nationally recognised as demonstrating excellence in arts and cultural provision. Holding Artsmark status demonstrates that our school values the arts and culture.